It's been a busy and exhilarating couple of months for scientists who study Jupiter— and space nerds fascinated by the gas giant. Yesterday, a team of researchers announced the discovery of 12 new Jovian moons, bringing Jupiter's total up to 79. Last week, scientists revealed that data from NASA's $1 billion Juno mission suggested there may be a previously undiscovered volcano on Jupiter's moon Io. And last month, the team behind Juno figured out that Jupiter's lighting is more similar to Earth's than previously thought — which solved a 39-year-old mystery. But most excitingly, NASA confirmed in June that Juno, which has orbited Jupiter since July 2015, will cheat death for at least three more years. The probe was scheduled to crash into Jupiter's clouds this month, but instead the mission has been extended until at least July 2021. That gives scientists a chance to complete the mission's main goal: to map Jupiter's magnetic and gravitational fields. This work is done by flying Juno over Jupiter's cloud tops at speeds roughly 75 times as fast as a bullet. These flybys, called perijoves, happen once every 53.5 days. The most recent one (Juno's 14th perijove) occurred on July 16, and the prior flyby was on May 24. The high-speed trips have allowed NASA to document the gas giant like never before. 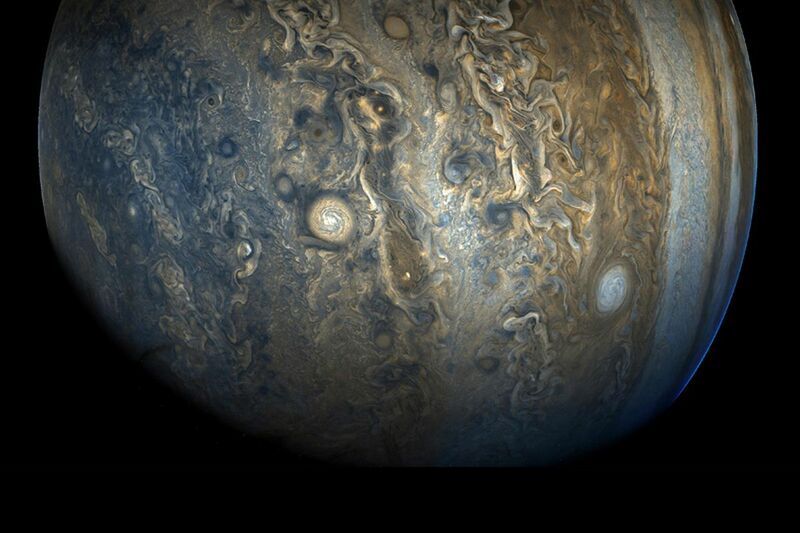 An optical camera called JunoCam captures beautiful images of Jupiter each time, and the space agency uploads the raw photo data to its websites. Then people around the world can download that data and process it into stunning color pictures. Here are mesmerizing images from the latest perijove, along with a few highlights from past flybys.